Reducing the cost of energy is a key driver for the wind turbine industry. kk-electronic has risen to the challenge by developing new technology to allow operators to monitor, analyse and optimise their turbine operations, saving valuable time and money. In the northern part of Jutland, Denmark, kk-electronic’s wind turbine is controlled by modules that form part of its groundbreaking C wind turbine platform. These modules have been developed to operate in the harshest environments, while the software inside them has been configured to maintain reliability and ensure continuous optimisation. With the C platform installed in the wind turbine, the operation is continuously controlled by robust hardware. Tests of EMC, temperature, altitude and vibration have shown that the C modules are more than capable of withstanding the adverse forces that wind turbines are exposed to. The modules also contain configurable and modular software, which gives the customer a new dimension in flexibility and the chance to use their own software applications. "We’ve spent the last couple of years at kk-electronic developing a control platform that can contribute significantly to solving a problem that the entire wind turbine industry faces: reducing the cost of energy," said kk-electronic CSO Tonni Birk Soerensen. "We felt that a new approach was needed, and that is why we’ve integrated systems, models and tools into C to make it possible to use the incredibly large amounts of data stored in the control system, not just for the purpose of regulation, but for measurements and analysis, simulation and development, and for testing and commissioning. "This means that we’re actually building an additional learning loop into the control system." With the new C platform, users will be able to simulate a number of everyday situations, enabling them to find ways of optimising how their turbines are operated. This might involve perfecting the algorithms that control the direction of the blades in the wind, or dimensioning the material thickness differently. Using the more active control features provided by the C platform, operators can anticipate factors and trends, minimising the load settings for the turbine. Key data is collected by the kk-electronic data logger and delivered by a SCADA solution to the turbine optimised tool chain (TOTC), a methodology and engineering tool for improving the development, commissioning and operation of the turbine. The traditional model-based tool chain consists of design, implementation, simulation, running-in, measurement and analysis, which are all done by specific tools with a defined purpose. In the TOTC, this has been extended to include features such as a database to enable easy and flexible configurations so that the right tools are used for software tasks. TOTC can also be integrated with aeroelastic design tools. Changes in information technology and wind power initiated a product development programme at kk-electronic with respect to the next generation of SCADA solutions. The company chose a user-centric design approach, focusing on four important aspects: users, activities, context and technologies. Having described users, their primary and secondary activities, interaction with wind turbine data and the environment, as well as decision activities, kk-electronic identified the technologies for grouping together to create a flexible solution that encompasses increasing user requirements and system complexity. The resulting solution, KK-PILOT, supports all kinds of devices, from big screen control room PCs to tablets and smartphones. KK-PILOT is built around a number of databases and an application layer consisting of alarms, events, data, configuration and commands. 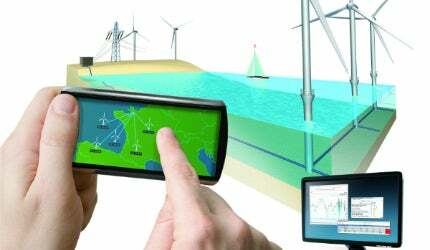 In KK-PILOT, kk-electronic has provided both a solution based on modern web technology and also a portal that offers a unified user experience for all those interested in wind turbine operations, from the CEO through to surveillance operators, service staff and developers. Bhlaraidh wind farm, located on the Glenmoriston Estate, 4km north-west of Invermoriston in the Great Glen, Scotland, UK, is being developed by Scottish and Southern Energy (SSE).